Sambucol Immuno Forte helps support the immune system. A strong immune system helps to fight infections. The antioxidant properties of Zinc, Black Elderberry and Vitamin C may help cell protection from free radical damage. Suitable from 12 years and over. 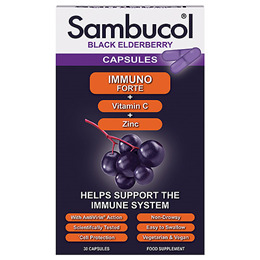 The flavonoids present in this Elderberry formula are among the most potent natural antioxidants available and Sambucol® is the most extensively researched Black Elderberry extract. Sambucol® products are all-natural. Vitamin C (Ascorbic Acid), Freeze-Dried Black Elderberry Juice Extract (Sambucus nigra) Capsule Shell [Gelatine, Colours (Carmoisine, Indigotine, Patent Blue V)], Bulking Agent (Maltodextrin), Zinc Sulphate, Anti-Caking Agents (Magnesium Stearate, Silicon Dioxide). Take 1 capsule daily on a full stomach with a cold drink. Swallow whole. Winter Dose: Take 2 capsules daily on a full stomach with a cold drink. Swallow whole. To be swallowed whole. Not suitable for children aged below 12. Store below 25°C in a dry place out of direct sunlight and out of sight and reach of children. Do not exceed the recommended dosage. Do not take on an empty stomach. If pregnant, breast feeding or under medical supervision, please seek medical advice before taking. Not suitable for vegetarians. 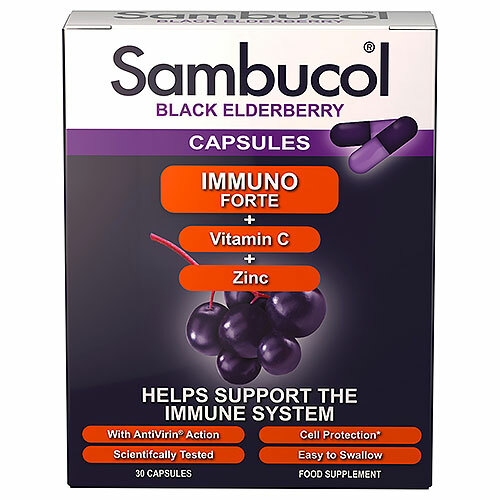 Below are reviews of Sambucol Immuno Forte - Black Elderberry + Vitamin C + Zinc - 30 Capsules by bodykind customers. If you have tried this product we'd love to hear what you think so please leave a review. Excellent - it works for me - I would not be without it! Sambucol Immuno Forte helps support the immune system. A strong immune system helps to fight infections. The antioxidant properties of Zinc, Black Elderberry and Vitamin C may help cell protection from free radical damage.